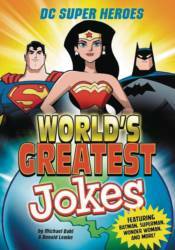 Hundreds of laugh-out-loud jokes featuring Batman, Superman, Wonder Woman, and other DC Super Heroes! Why does Bruce Wayne brush his teeth every night? So he doesn't get Bat-breath! Where do most of the world's super heroes live? Cape Town! Featuring more than 400 kid-approved jokes and full-color artwork, this official DC Comics joke book will have readers exploding with laughter! The perfect gift for super hero fans young, old, and everyone in between!